A goal without a plan is just a wish. Happy New Year! How’s yours started? Even though I don’t set absolute goals for January, as I tend to set goals throughout the year, there’s something refreshing after the longish Christmas break to wake up one morning, as I did this year, and say “OK, I’m back, energised, motivated and looking for something new to focus on in January”. So in the first week of January, I took a look at my personal life in the areas of health and charity work, and decided to set some enjoyable goals in line with my values. Health, as you know from a previous blog, is important to me, but because of some physical challenges I have to be aware of what exercise I can do. I tried out Yoga classes late last year as a form of ‘kinder’ exercise and this year I’ve committed to continue with them. I’ve just signed up to do weekly group Personal Training instead of 1-1 as I’ve never done that before and I’m really enjoying them, and I’ve put myself forward as a volunteer with Homestart which having researched their work, really appeals to me, I start on 1st Feb.
I’m excited by these new goals. They’re in line with my values and therefore feel good. When you know what drives you (values) it’s much easier to keep going with the goals you set, there’s no ‘must’ or ‘have to’, you actually want to. So if like many people you’ve found your New Year resolutions are already a distant memory, take a look at what’s important to you and set some new ones that are in alignment with who you are. I think it’s just about ok to wish you a Happy New Year. Here’s to a wonderful 2017 wherever you ‘let it’ take you. 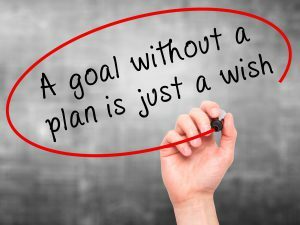 And remember, a goal without a plan is just a wish!